AS Monaco host Pep Guardiola’s Manchester City on Wednesday night at Stade Louis II for the 2nd Leg of the round of 16 of the Champions League. 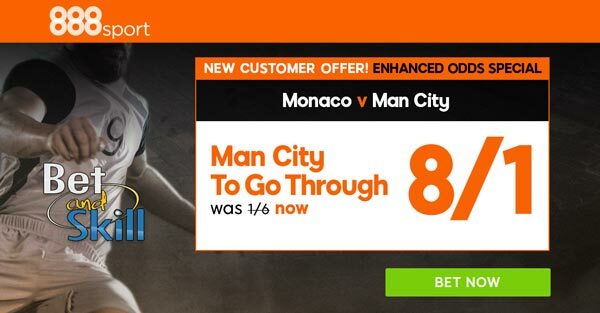 Read here our Monaco v Man City betting preview with predictions, betting tips, probable line-ups, team news, enhanced odds, bookie free bets and no deposit bonuses on this match. The first leg between these two teams turned out to be a thriller. Monaco led 3-2 at one point, missed a penalty and caused Manchester City serious problems for 70 minutes but their shaky defense conceded three goals in the last 20 minutes and inally lost 5-3. A 2-0 victory for Monaco would be enough here and it is not impossible for a team that go into this match in fine form having lost just one of their last 17 competitive games. Furthermore, Monaco have scored 50 in their first 14 Ligue 1 games on their own pitch this term, nearly double that of Paris Saint-Germain! They are the highest-scoring side across Europe's five major leagues this season. Centre-back Kamil Glik is suspended but Jemerson is available and should start alongside Andrea Raggi at centre back. Falcao is an injury doubt for Monaco. Should he be absent Valere Germain will earn a recall and partner the youngester Kylian Mbappe upfront. Tiemouè Bakayoko and Joao Moutinho are in contention for a starting berth in midfield. Boschilia and Guido Carrillo are both ruled out for Monaco, who are otherwise at full strength. Manchester City is unbeaten in the last 11 matches in all competitions, winning 8. Since heavy 4-0 defeat at the hands of Everton, the Citizens have won four and drawn two of their last six league outings. Furthermore, Guardiola's men progressed in the FA Cup with a 2-0 win at Middlesbrough last Saturday, meaning they have now gone six without conceding a single goal on their travels. In the Champions League group stage Man City lost 4-0 to Barcelona and drew at Monchengladbach (1-1) and Celtic (3-3). Kevin De Bruyne could be dropped from the engine room to make way for a defensively-stronger midfield, which will likely include Yaya Toure and Fernandinho. Up front Sergio Aguero will be supported by Leroy Sane, Raheem Sterling and David Silva. Vincent Kompany is a fitness doubt while Gabriel Jesus and Ilkay Gundogan are the only long-term absentees. "Monaco v Manchester City predictions, betting tips, lineups and odds (Champions League - 2nd leg - 15.3.2017)"